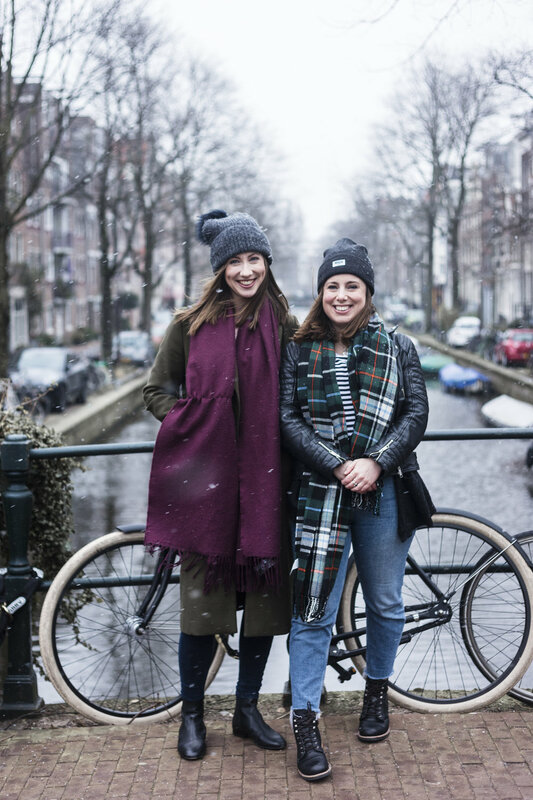 We can hardly believe it but our half a year in the Dutch capital is at an end, and neither of us have been hit by a bike OR fallen into a canal (although we don’t want to speak too soon, there are still a few days left). We’ve well and truly made the most of our time here, having all sorts of adventures and getting stuck into the Amsterdam way of life, so we thought there would be no better way to say goodbye than by writing a rundown of our favourite places to eat, drink and be merry, for you to enjoy. This was our neighbourhood and most places here will fall outside of the usual tourist guidebooks. The West offers you a great opportunity to explore more traditional Dutch life, fill your bellies and plenty to wash it all down with. Foodhallen – This was one of our most popular meet up spots. Inside a beautiful industrial-style building full of quirky shops and a great cinema, the main event is definitely the Foodhallen. Featuring loads of delicious food choices and a dedicated G&T bar, it’s a great spot if you can’t quite decide what you fancy to eat. They also have a great DJ in the evenings at weekends. Mook Pancakes – The only way to spend a Sunday morning; mouth-watering pancakes, great coffee and a good juice menu. Get there early to avoid the queue as they don’t take reservations. Yam Yam Pizzeria – Low key but absolutely delicious pizza and pasta for a reasonable price. Golden Brown Bar – The BEST Tom Yam soup either of us have ever tasted, and the chicken satay was yummy too, this chilled pub + Thai food combo creates a great atmosphere for the evening. Waterkant – If you like old school RnB and multi-story carparks, this spot (usually only full of locals) is perfect for a late night boogie. It’s right on the water so the best place for sunset drinks when the weather is nice. If you have come to Amsterdam for canals and postcard-perfect houses, the many winding streets of the Jordaan is the place to go. Due to the Dutch fashion of never closing their blinds, you get the chance to have a nosy into some very fashionable homes too! Café Thijssen – A great spot to refuel while you’re exploring the eye-wateringly beautiful canals of the Jordaan. This traditional Dutch watering hole has amazing apple pie and the French Onion soup is worth checking out too. Tales and Spirits – If you’re a cocktail fiend you might find it tricky to get your fix in most of the bars across the city. This bar (and the nearby Vesper bar) both have absolutely top notch cocktails, along with a cosy atmosphere and brilliant customer service. Another place that the locals go to in order to avoid the tourists, De Pijp is packed full of hipster bars, boutique shops and great coffee spots. Come hungry, leave amply fed and watered. Bakers and Roasters – This is a great brunch spot where the portion sizes will leave you full up until the afternoon. It’s New Zealand themed and offers a great variety of dishes. Queuing is likely so don’t turn up too hungry in case you have to wait, it’s well worth hanging around for though. Glou Glou – Our FAVOURITE wine bar. All the wines are organic and absolutely delicious… make sure you try the cheeseboard as well! It’s just down the road from the Sarphati Park so you can leisurely walk off your treats afterwards. A short (and most importantly FREE) ferry ride away from the Central Station, the North should not be dismissed. It’s full of arty installations, great restaurants and markets and some very Instagram-worthy graffiti. Pllek – If you hop on the free ferry at the back of the central train station to NDSM wharf you’ll arrive on the north bank of the river in less than 15 minutes. From there you can get to the shipping container construction that is Pllek. It has a beach beer garden for warmer weather, often has live music and a great selection of food and drink. It’s easy to spend a whole Sunday hanging out in here. You'll be spoilt for choice both from Google and guidebooks about what to fill your eyes with as you wander around the city. We've tried to help narrow down the list to our tried-and-tested favourites so you get the most out of your time here. Vondelpark - This was a stone’s throw away from my (Nat) house so I basically lived here. It’s a beautiful chunk of green space if you’ve had your fill of canals. The café is a bit of a tourist trap so we recommend grabbing a takeaway coffee en route and wandering around the fountains, lawns and woodland areas at your leisure. NDSM – We mentioned NDSM wharf above for Pllek, but they also have one of the biggest flea markets in Europe. Make sure you check if it’s on during the dates you want to go, turn up early and make sure you bring cash … You’ll leave with vintage treasures galore! Van Gogh Museum – One of the tourist guide favourites but definitely worth a visit. For an extra few euros you can do the audio tour which we think is the best way to get the most out of your visit. You can then explore the paintings in whatever order you want, at your own pace and learn loads of extra facts along the way. Foam – This is a photography gallery not too far from the Museumplein but every time we’ve been it has been packed full of really interesting exhibitions from artists all over the world. Great if you fancy a bit of culture slightly off the beaten track. A’Dam Lookout – If you take the other free ferry you’ll arrive at one of the best viewing points in the city. It’s super reasonably priced if you compare it to somewhere like The View from The Shard, and includes Europe’s highest swing on the roof for those feeling brave. For the non-dare devils out there there’s a great bar where you can watch the sun setting over the city whilst sipping wine. 9 Streets – If you prefer to do your shopping in a more civilized fashion then a meander around the 9 streets in the centre of town will guarantee a lighter wallet on your way out. There are some lovely boutique clothes and accessories stores with lots of good coffee shops to keep your energy levels up. The 9 Streets is also home to one of our favourite co-working hangouts The Hoxton. The Windmill Brewery – Drinking Dutch beer in a windmill next to a canal… enough said. The juicy ones. The ones the Dutch don't want you to know about. The ones they want to keep all to themselves while you look at red windows and yet another cute bridge. These are our pick of the crop that we've dug a little deeper to find, but they're oh so worth it. De Ceuval, Amsterdam North – My absolute favourite place (Jess) that’s hidden away from the general hustle and bustle you’d expect in any international city. The building was designed by architect Wouter Valkenier who made the whole building from upcycled materials. Built to be fully self-sustainable De Ceuval offers a tranquil spot to eat delicious organic home grown produce. Rembrandt Park – This is just a bit further out than the VondelPark and it’s a bit more ‘rugged’ and a lot less busy. Botanical Gardens – Established in 1638 this is one of the oldest botanical gardens in the world. A beautiful little escape in Amsterdam East. Day trip to Haarlem – If you have some time to spare we would highly recommend a day trip to the district of Haarlem, a 15-minute train ride away from Amsterdam Centraal. A highlight was the Haarlem Hofjes (beautiful hidden gardens throughout the city) and Jopenkerk a brewery run out of an old church. Off we go... London town awaits! So there we have it. We came, we saw, we ate more bitterballen than is probably medically recommended. Hopefully you’ve enjoyed following our Dutch adventure and will come along with us on the next chapter in London. If you’re planning a trip to the Dam and want any more tips, let us know! All that’s left now is to bid farewell to our canal-side home, thanks for having us, we’ll see you soon! Thank you to the wonderfully talented Mart Goossens from Ministry of Frames for our fab photos!